Living near Lansdowne & St Clair, a pho craving is usually satisfied by heading westwards to the little pho village that's formed over near Weston Road. In the last year though, a little spot called Pho Rang Dong has brought this classic Vietnamese noodle soup much closer to home, opening shop right in the heart of Corso Italia. Rare Beef Pho ($6), Well Done Beef & Rare Beef Combination Pho (for the indecisive beef lover) ($6) and an order of Vermicelli/Bun ($7). The latter is my pick, and while I usually go for the chicken & spring roll bun combo at most places, I notice Rang Dong has a 'Deep Fried Cinnamon Ham and Spring Roll' incarnation, so I decide to let my curiousity rule for a night. Over by the counter/kitchen, a television plays some kind of Asian soap-opera. The volume is off, but loosely translated sub-titles are in English, and we're quickly drawn in to the drama of a young woman trying to escape being forced into the 'life' at some kind of secret upper-class brothel. The food arrives quickly, distracting us from a couple of soap scenes as we look over each other's dishes and marvel at a) the size of these bowls and b) the sweet aroma rising up from the broth (not be confused with the aforementioned brothel...um...). 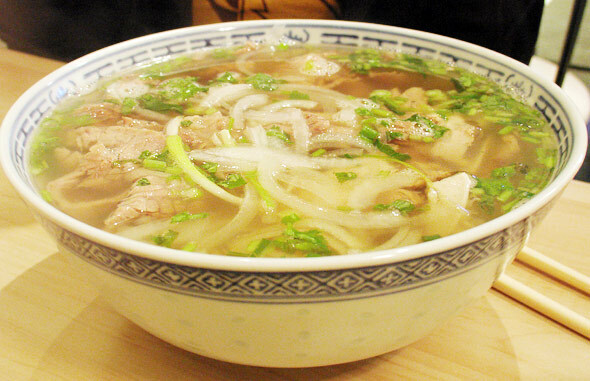 In terms of portion-sizes, Pho Rang Dong offers Large and XL sized bowls of pho for $6 and $7, respectively. A large bowl can easily serve two people or one big appetite (ie. my co-diners). The pho itself was well prepared: soft noodles, tender beef and a light yet flavourful broth. It wasn't the kind of outstanding meal that made us want to swear off every other pho house in town, but it was certainly a good, quality dinner. Between the two pho bowls, we found the combination beef dish a better pick in terms of value (more beef) and overall richness of flavour. As for the Bun (pictured at the top), it was definitely an interesting and tasty menu find. Once again, the portion was quite large and would very much work as a shared dish. The spring rolls were full-sized (conveniently chopped up for the chopstick yielding diner), packed, and really, really crispy. Part of me wants to call them over-fried, but the other part has to admit that the crispiness really was the best part. The thinly sliced cinnamon ham looked SPAM-like, but thankfully didn't taste that way. The flavour is hard to describe, mostly because no strong spice (not even cinnamon) stood out to me. Now, it wasn't exactly bland -- don't get me wrong -- but definitely a candidate for some chili sauce dipping. Side salad was a nice touch. All-in-all, a good deal for $7 flat. Pho Rang Dong closes at 9pm, which is earlier than that soap opera ends, so be forewarned, you aren't going to get to know if she escapes or not. But then again, regardless of language, it's a soap, so really, I'm sure we could stop in for some pho and bun next week and pick up right where we left off.